ARTMIP-Early Start Comparison of Atmospheric River Detection Tools: How Many Atmospheric Rivers Hit Northern California’s Russian River Watershed? A team led by CW3E director Marty Ralph recently published a paper in Climate Dynamics titled ARTMIP-Early Start Comparison of Atmospheric River Detection Tools: How Many Atmospheric Rivers Hit Northern California’s Russian River Watershed? (Ralph et al. (2018)). Many Atmospheric River Detection Tools (ARDTs) have now been developed; however, their relative performance is not well documented. This paper set out to address this gap in the simplest possible way – at a single location where unique in-situ observations of AR conditions could be used as well. The analysis team included the developers of many of the key ARDTs used most often today, and represent several key organizations studying ARs, i.e., NWS, NASA, NOAA/ESRL, CSU and Scripps/CW3E. 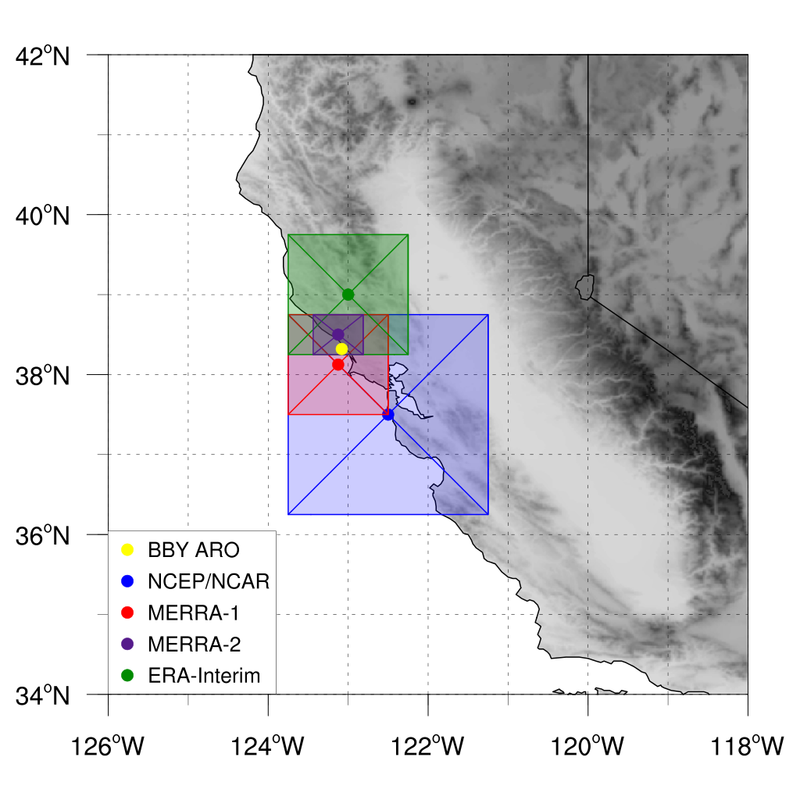 As such, this study provides an early-start analysis that helps set the stage for the Atmospheric River Tracking Method Intercomparison Project (ARTMIP) community effort, which has been organized by an ad-hoc planning committee (Shields et al., 2018). In this work, we quantify the sensitivity of the diagnosed number, duration, and intensity of ARs to the choice of ARDT and to the choice of reanalysis data. Results did not vary much with reanalysis data set, regardless of very different resolutions (Fig. 1). However, the annual AR event count varied by about a factor of two (10-25 per year) depending on the ARDT. Average AR duration and maximum intensity varied by less than ±10%, i.e., 24 ± 2 h duration and 458 ± 44 kg m-1 s-1 maximum IVT (Fig. 2). This work provides an important foundation for researchers as they consider using various ARDTs and evaluate what the choice of ARDT might mean in terms of results. It also provides insight into why counts differ so much across methods, and shows that such differences are reasonable and should be expected. Figure 1. (Figure 1 from Ralph et al., 2018): Map of the study region with the Bodega Bay ARO location marked in yellow. Grid center points and boxes for all of the reanalyses used in this study are presented in solid markers and shading (colored according to scale). Terrain represented by gray shading. Figure 2. (Adapted from Figure 4 and Table 5 in Ralph et al., 2018): (left); Number of distinct AR events counted by each native reanalysis-based AR catalog at the grid cell containing BBY (see Figure 1) during water years 2005-2015. Dashed lines(*) indicate methods that identify ARs that persist for at least 12 hours with much higher AR strength thresholds. (right); AR event counts with ARDT characteristics. ARDTs are sorted by criteria. * indicates those catalogs that are designed to identify only stronger storms; ** indicates observational catalogs with significant missing data during some years; *** indicates catalogs using IWV alone.